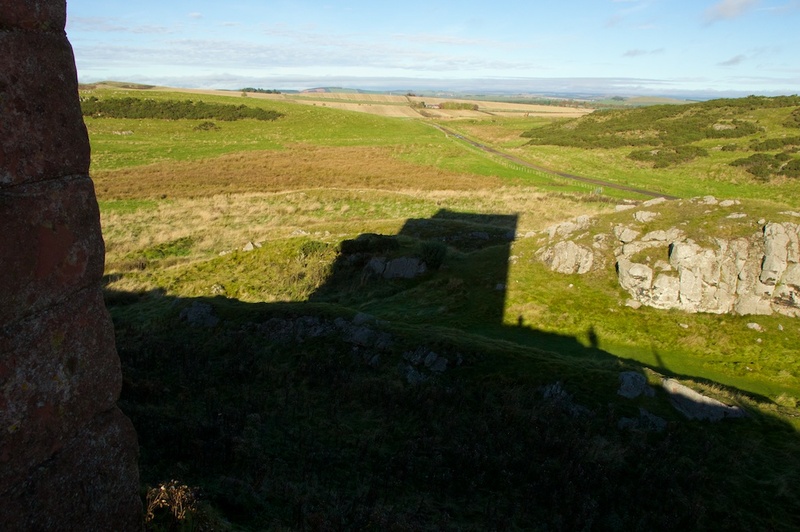 Smailholm Tower rises above the rolling landscape of the Scottish Borders like a silent sentinel. We’ve glimpsed it on many occasions but just recently, on a lovely day in late October, we drove right up to take a proper look. The road ends in a track that leads through the farmyard of Sandyknowe Farm. A couple of hundred yards later, you reach the base of a rocky outcrop and you realise just why the tower was situated here. There are far-reaching views on almost all sides: the inhabitants of Smailholm must have been able to see their visitors from miles away, and had time to pop some scones in the oven had they been so inclined. But most of the parties bound for Smailholm in the 15th century were not the kind to be offered tea and cakes. 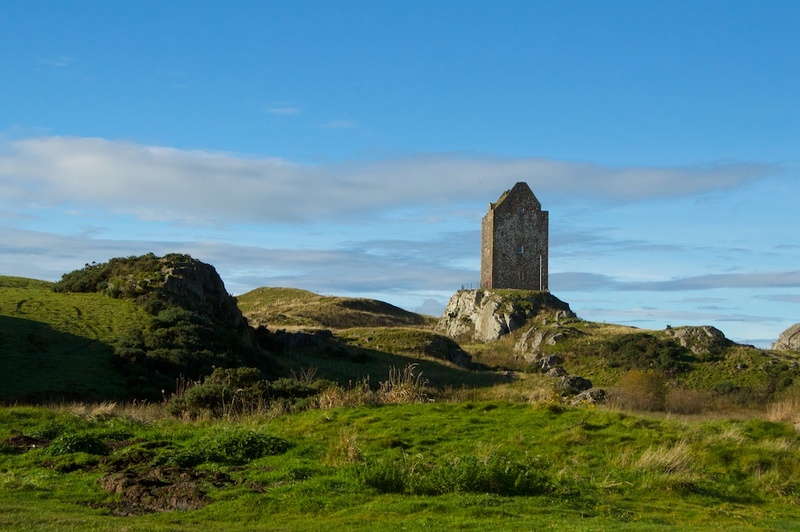 Smailholm is a peel tower, built by the Pringle family around 1450 for defence against cattle raiders or ‘reivers’. 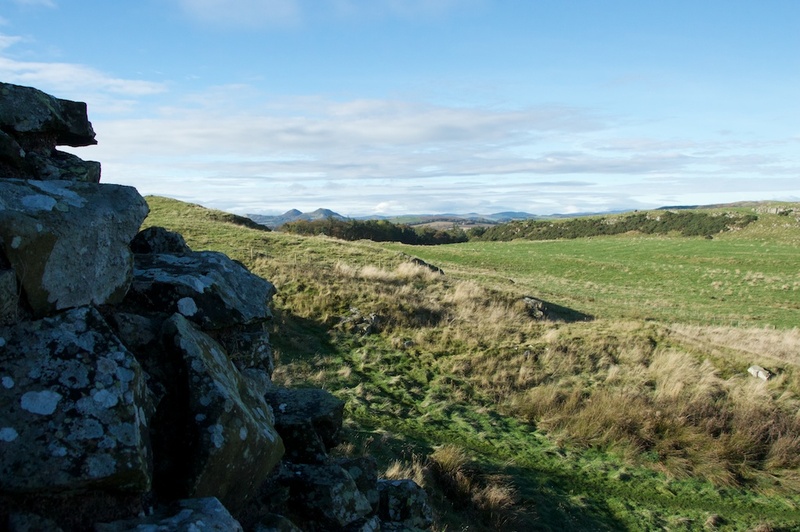 Reiving was an illegal but highly profitable activity, indulged in by generations of Scots and English families on either side of a hotly disputed border. Cattle were valuable possessions, representing a source of food as well as breeding stock, and their loss spelt years of hardship for the landlords and their tenants. Their unfortunate owners, having lost their livelihood, were lucky if their house or castle wasn’t razed to the ground as well. 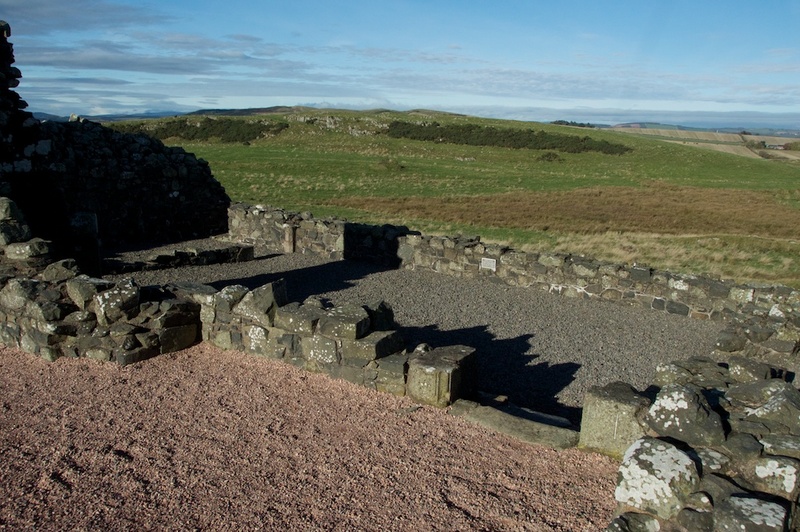 Preparation was the best form of defence, and strongholds had to be designed to protect not only the laird’s family but also as many of his livestock as could be rounded up and got inside a thick enclosing wall. In the Scottish Borders, a number of tall ‘peel’ towers were built (the word deriving from the Latin word ‘palus’, meaning ‘stake’ – literally, a fenced-in area or palisade). The Pringles of Smailholm weren’t taking any chances. 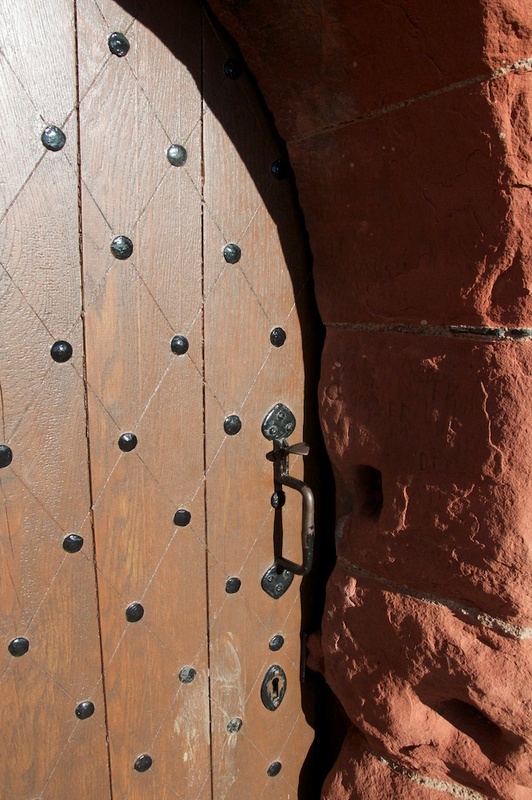 The enclosing wall or barmkin was nearly seven feet thick, and weapons placed in the castle’s gun loops would have been trained on unwelcome guests. 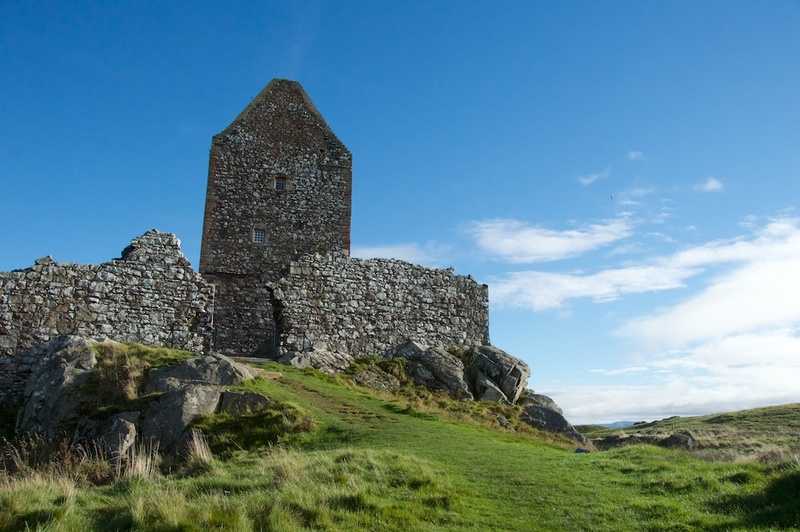 Even this doesn’t seem to have been enough of a deterrent: on just two nights in 1544, raiders from Northumberland made off with 723 cattle, 108 horses and 104 prisoners from Smailholm village. An amnesty was agreed when John Pringle agreed not to go on any raiding parties into England. It makes you wonder what he did with his Saturday nights from then onwards. In 1645 the tower passed to the Scotts of Harden, from whom the writer Sir Walter Scott is descended. 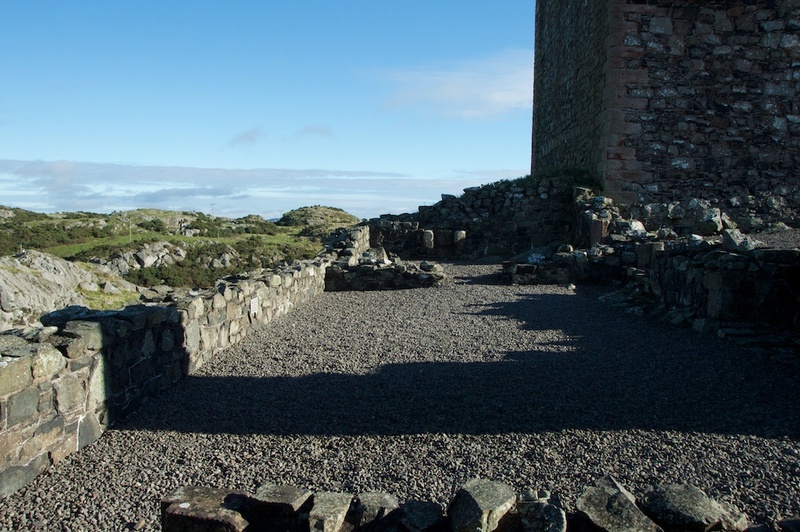 As an infant, Scott stayed in Sandyknowe Farmhouse which by then had replaced the tower as a family home, and listened to his grandmother telling him stories about Border reivers. Smailholm proved to be an inspiration for some of his later writing. 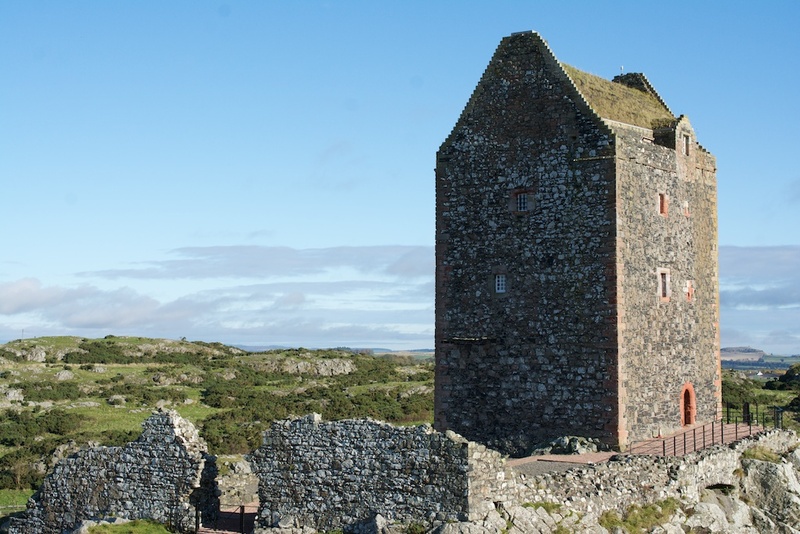 On the upper three floors of Smailholm Tower is an exhibition of costumed figures and tapestries that evoke the area’s turbulent history. Its roof, which has recently been restored, is a fine example of ‘soft capping’ – a living colony of sedum, grasses and plantains which help to reduce the volume of rainwater that runs onto the walls. We were too late in the season to catch the tower while it was open, but it was magnificent just to walk around the outside and glimpse the view that the people here would have gazed out on, 500 years ago. It’s an imposing presence from all angles, much bigger than it appears from a distance; I loved the shadow that it cast on the ground, like a huge sundial. This place has seen a lot of drama, romantic perhaps only in hindsight. I’m sure its beleaguered residents would have chosen peace, given half a chance. They might have liked to hear the moorhens on the old millpond beneath the walls, and robins singing autumn songs in the sunshine. Smailholm is about five miles west of Kelso. 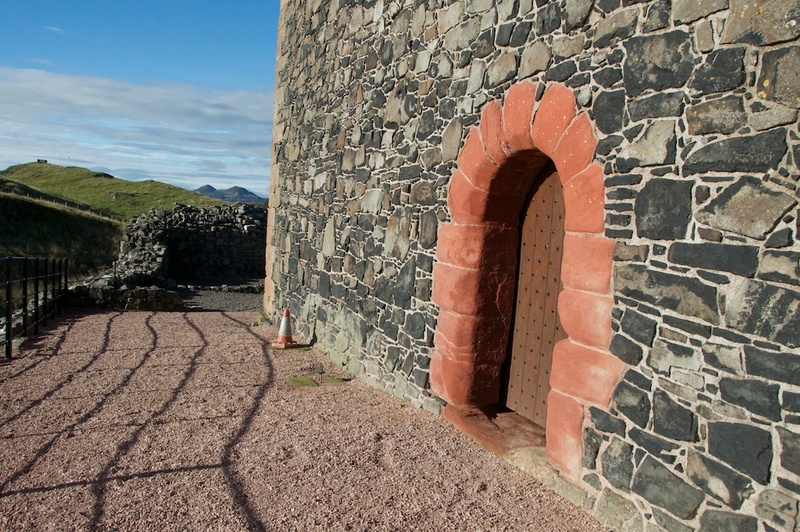 For directions and opening times, visit the Historic Environment Scotland website (below). What an amazing place, and what an interesting history! Must be quite a sight from those upper floors. I’d heard of reivers, but didn’t actually know what they were. Somewhat like our cattle rustlers from the 1800’s. I’ll have to look them up. Wonderful photos, thanks! Yes, I bet it was a trifle windy at times, too! Reiving was big business and I’ve got to say that I’m a member of the Scott clan, so I can’t dissociate myself! Glad you enjoyed this, Pat – it was a fab day for photos. Thanks, Susan! We tend to overlook the Borders but there’s so much history down there. 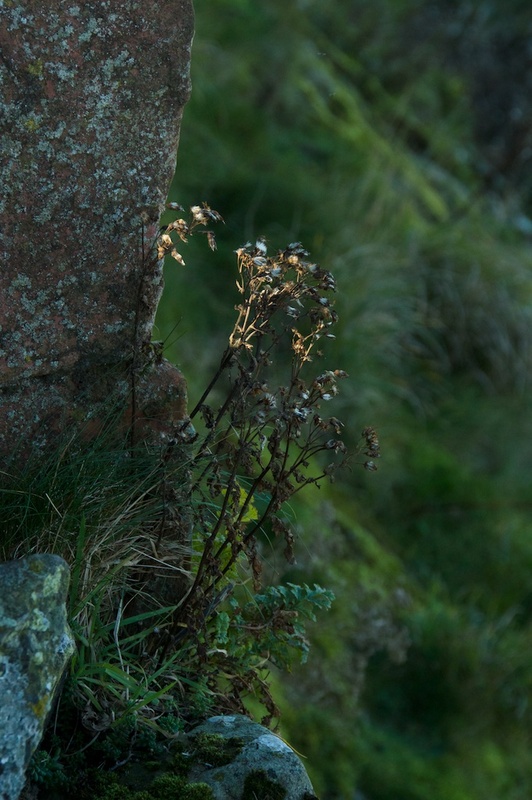 Superb photos of Smailholm. I have been there many times. I have read that Sir Walter, as a boy, would lie outside its walls and think of the stories that his grandparents told him about the Border Reivers. No doubt he would be very proud of his name, Scott, and his descent from Auld Wat of Harden. Thanks for such a great blog post. Have you ever seen the ancient trees at Lochwood, the home of the Johnstones? I talk to them when I visit. I love them. Just catching up Jo. No problem with the link. Carry on with your good work, your wonderful blog I just love trees. Listened to a discussion on Radio Cumbria about three weeks ago. Basically how they communicate with other trees, especially their own kind, through their roots. The science was beyond me but I have always felt that they have a presence, that they do not exist in silence. Might sound fanciful but I feel that they talk to me. You’ve brought Smailholm Tower alive, I had no idea it was such an interesting building. I’ve seen it in the distance but I feel I should take a closer look after reading this post. Excellent photos, I really like the close-up of the wall, what a beautiful construction. Thank you, Lorna! It’s worth a visit, probably more so when it’s open (! ), but sometimes it’s nice to visit places out of season. The walls were very impressive indeed. Such a quiet landscape there now, that it’s hard to imagine what the Borders must have been like at that time. Those people lived in some bleak places. Was it all worth fighting over, one has to wonder? Anyway, thank you for that, Jo. There are several peel towers on the Furness peninsula, where I was brought up, but I didn’t know the origins of the word until I read your piece. I’m pretty sure it wasn’t, Alen, and if they all kept the cattle they started off with they would have been a lot happier. But I am guessing they enjoyed a bit of a scrap now and again. I liked finding out about the ‘peel’ thing as well – the park around Linlithgow Palace is called the ‘Peel’ for the same reason. 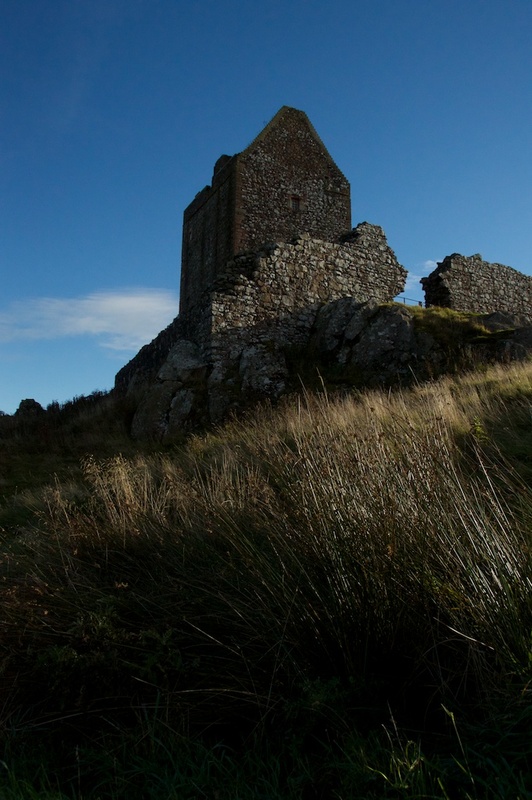 Love the Scottish scenery and history, Jo! Happy New Year!